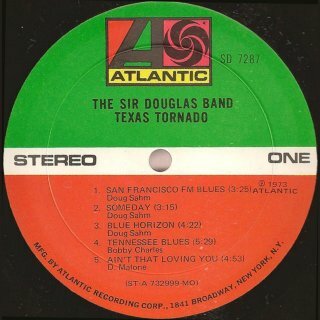 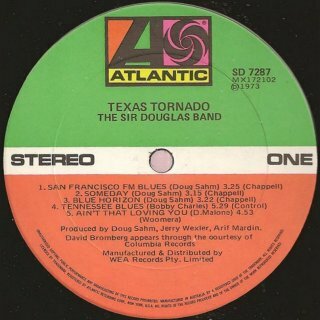 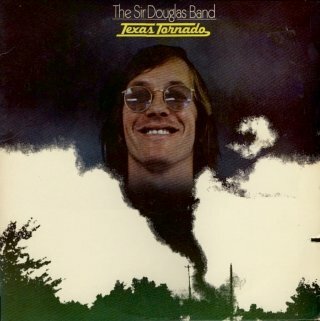 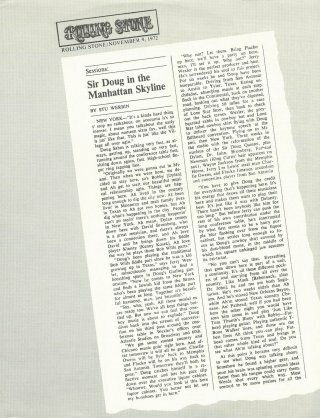 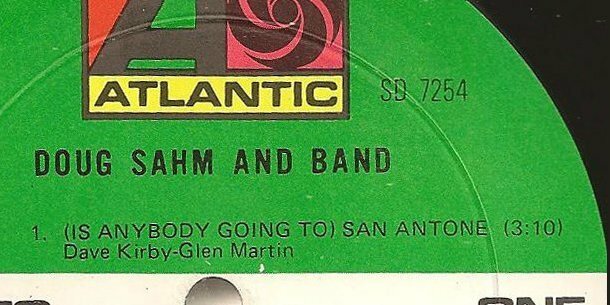 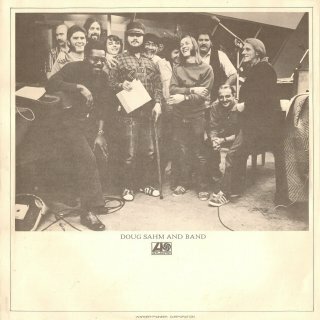 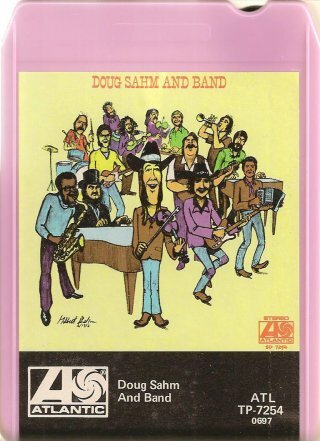 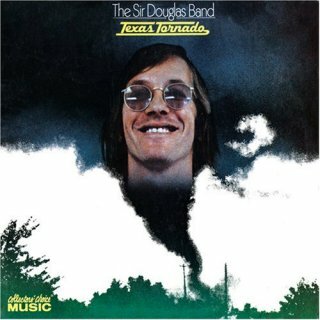 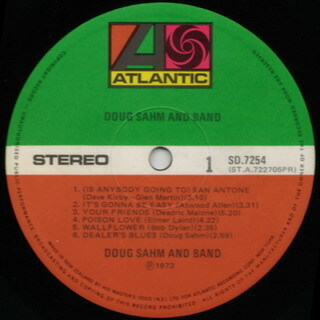 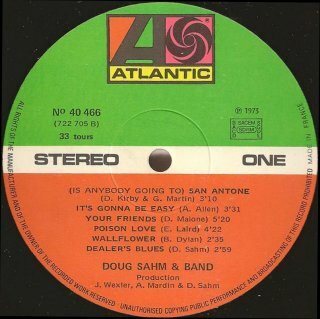 1973 "Doug Sahm and Band"/"Texas Tornado"
Audio: 1973 - "Doug Sahm and Band"/"Texas Tornado"
Because of the length of the 1973 page, this sub-page contains all the entries for these releases, both the original 1973 LP releases, tape releases, and any associated 7" singles. 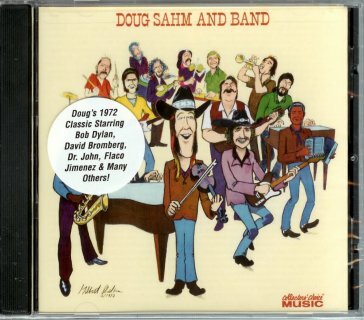 For the Rhino Handmade US 2CD set "The Genuine Texas Groover" bonus track also including Bob, see 2003. 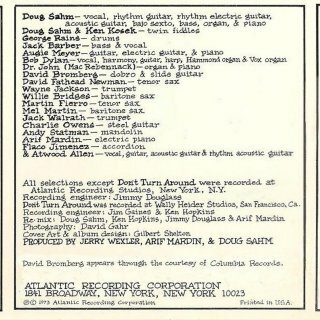 This album was recorded at Atlantic Recording Studios, New York, 9-12 Oct 1972 and produced by Jerry Wexler. 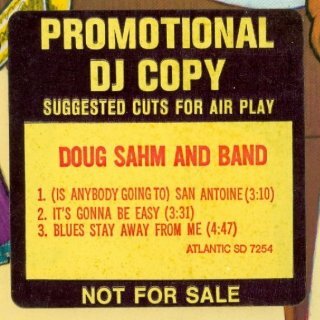 This mono version was not released commercially. 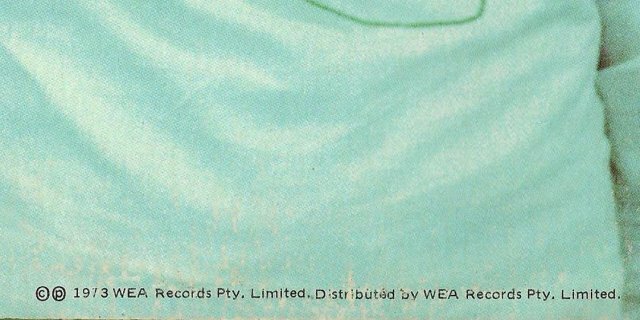 Renaud Depierreux's copy comes with the same stickers and white promo record labels plus two press inserts, one double-sided. 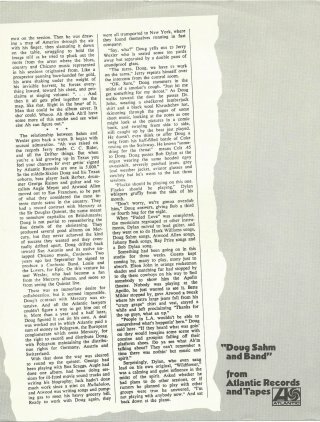 The first press insert is a reproduction of an article from "Rolling Stone" magazine, 9 Nov 1972, and the second press insert is a reproduction of an article from "Words & Music", Jan 1973. This album was previously listed as Dec 1972, but Jan 1973 must be the release date and the record labels are dated 1973. 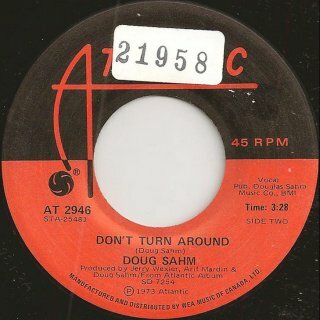 Released in mono on the B-side of a 7" US promo single, see below. 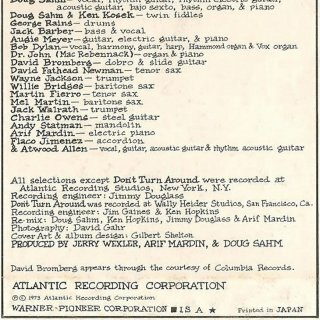 Bob's own recording of this song was finally released on The Bootleg Series Vols. 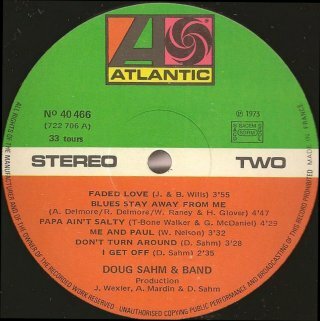 1-3 in 1991. 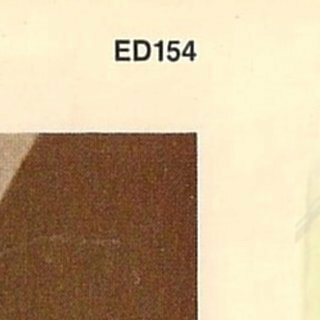 The record of Renaud Depierreux's copy has handwritten matrix numbers: Side 1 - A-14181-B, Side 2 - A-14182-A. 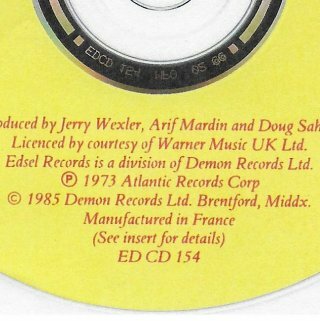 Thanks to Arie de Reus and Renaud Depierreux for information and scans. This album was previously listed as Dec 1972, but Tim Dunn gives the US release date as 11 Jan 1973, and all the record labels are dated 1973. 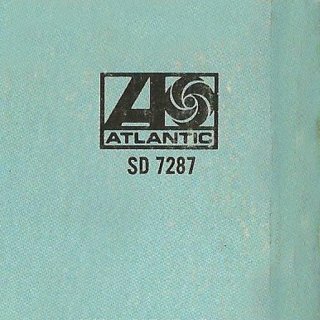 Atlantic SD 7254 (USA) - front scan by Olav Langum This album was recorded at Atlantic Recording Studios, New York, 9-12 Oct 1972 and produced by Jerry Wexler. 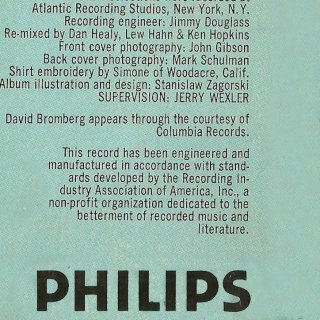 The US release has a generic paper inner sleeve with details of 16 contemporary Atlantic albums on each side. 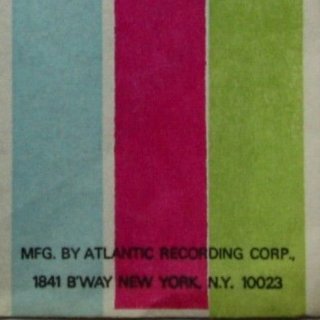 The Atlantic Records address on the rear of the sleeve is 1841 Broadway, New York, NY 10023. During 1973 Atlantic Records moved to 75 Rockefeller Plaza, New York, NY 10019, and this new address is on the sleeve of the Dec 1973 Texas Tornado album below. 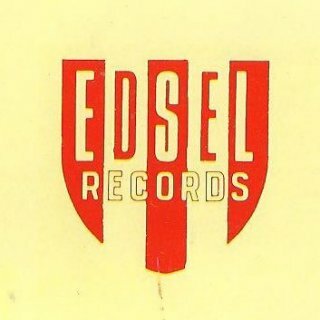 There are at least two variant record labels with differences as shown. 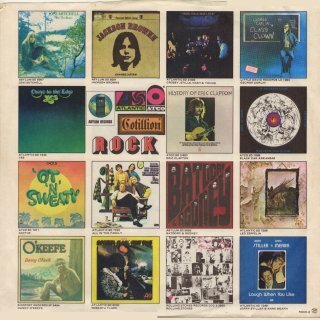 The second copy shown comes in the same outer and inner sleeves: this copy has a Warner sticker glued on to the inside of the sleeve with "FEB-11-1973". 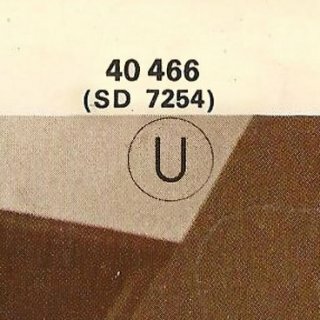 The year of release, "1973", under "ONE" is printed in the orange area, not partly in the white stripe. 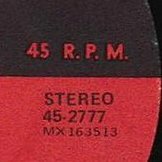 Both copies were made in different pressing plants: the printed matrix numbers at the bottom of the labels of the first variant are "ST-A-722705/06-RI" and those of the second variant are "ST-A-722705/06-MO". 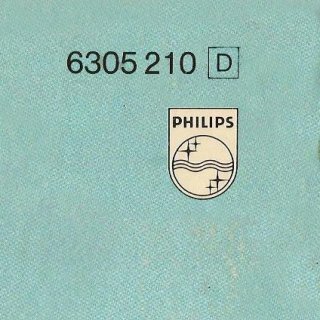 Pressing plant codes: "RI" = Philips Recording Co., Richmond, IN. 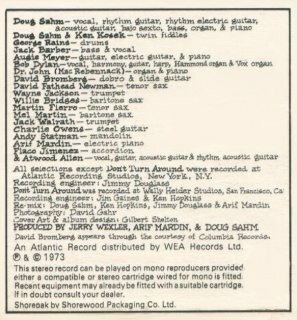 "MO" = Monarch Records, Los Angeles, CA. 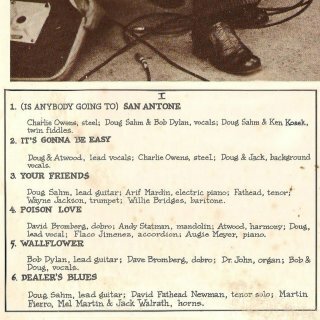 R-0088 Wallflower - Bob shares lead vocal and plays guitar. 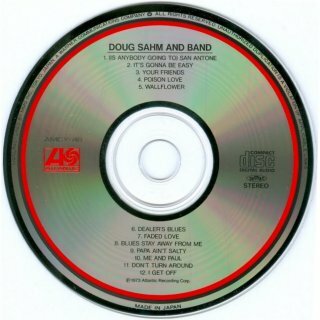 R-0088 was re-released on CD in 1992 on Doug Sahm & Friends: The Best Of Doug Sahm (Atlantic Sessions), see 1992, and on the Warner Bros Germany 2CD compilation Are You Ready For The Country?, see 2001. 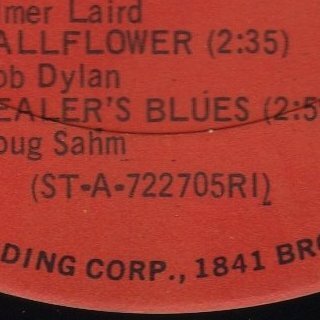 For a Columbia acetate of Bob's own recording of this song, finally released on The Bootleg Series Vols. 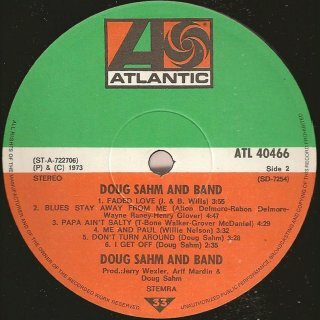 1-3 in 1991, see 1971. 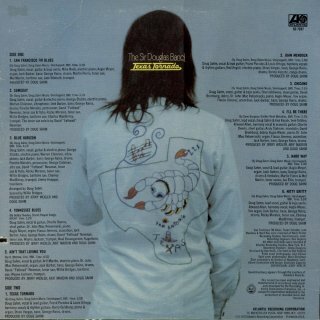 All these tracks additionally appear on the 2003 Rhino Handmade 2CD compilation The Genuine Texas Groover, see 2003. 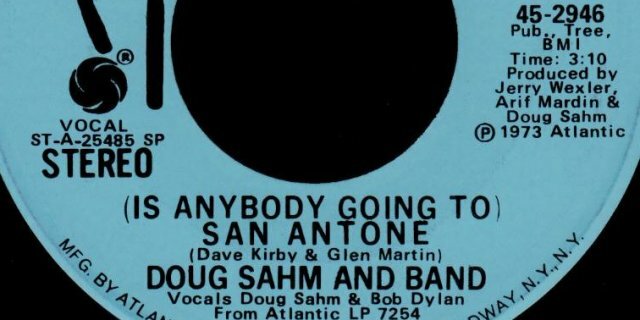 Thanks to Tim Dunn, Olav Langum, Bill Hester and Manuel García Jara for information and scans. 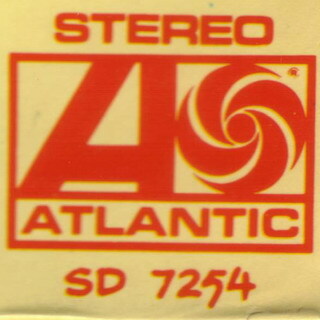 Atlantic ATL TP-7254 (USA) - front of slipcase, scan by Manuel García Jara This regular Atlantic 8-track release has a pink cartridge inside a black slipcase open at the sides. 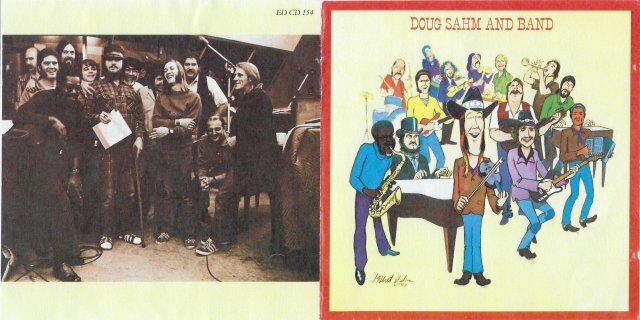 Two copies are shown, one sealed with a $2.99 price sticker, one open. 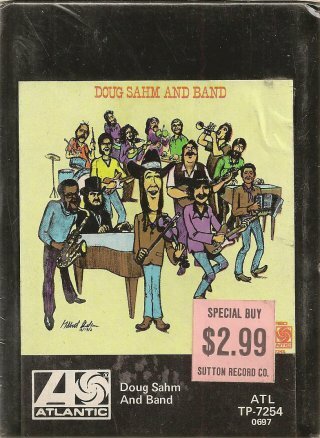 The cartridge has a single black folded paper label. 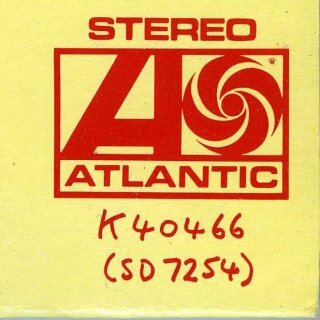 Atlantic K 40466 (UK) - front scan by Kenneth Robson (1973 release) The original 1973 UK album is almost identical to the US release. 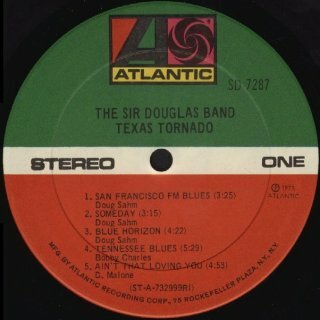 The sleeve was printed in England by Shorewood Packaging Co. Ltd. 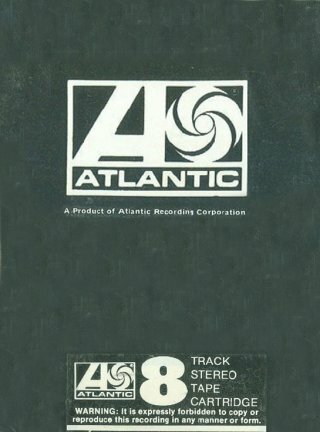 The front sleeve has the Atlantic logo at bottom right with handwritten UK and US catalogue numbers below. 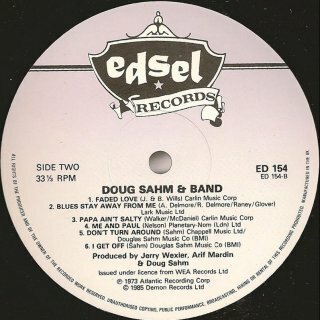 The album was re-released on both vinyl and CD by Edsel/Demon Records in the UK in 1985. 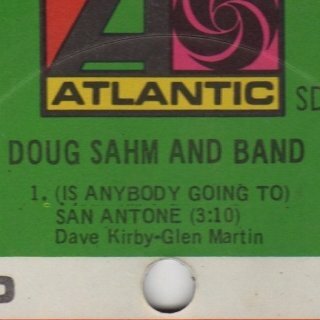 For the 1985 CD release, see below. 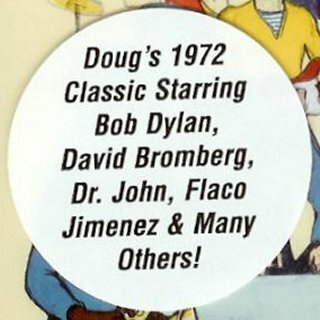 Thanks to Peter Gilmer, Kenneth Robson, Olav Langum and Manuel García Jara for information and scans. 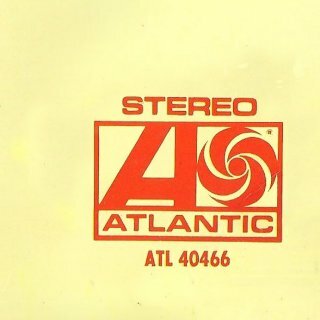 Atlantic ATL 40466 (NL) - front scan by Manuel García Jara This album can be identified as the Dutch release of this album even though "Made in Holland" is not printed anywhere on the sleeve or on the record labels. 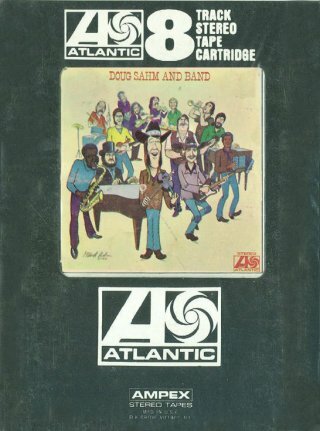 The front sleeve has the Atlantic logo at bottom right with the catalogue number below. 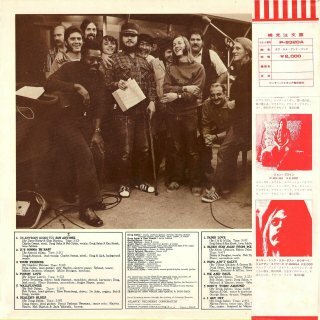 The rear sleeve is almost identical to that of the US release, even misleadingly including the text "Printed in U.S.A.". 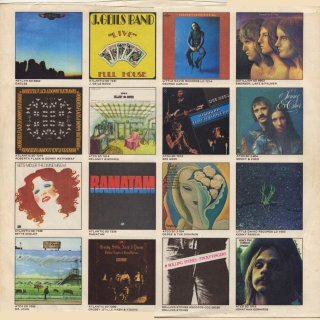 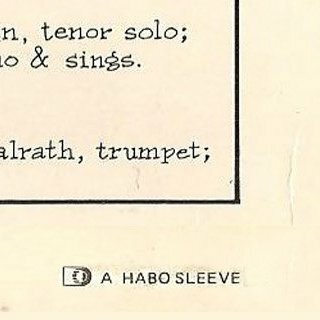 However the sleeve was printed in Holland - there is a small detail at bottom right of the rear, "A HABO SLEEVE" ("Habo" was a well-known Dutch printer who printed the sleeves of the Dutch releases of the Beatles albums amongst others). 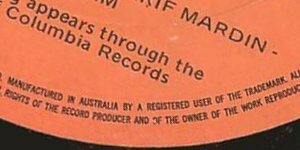 Also, the record labels have the logo of the Dutch copyright organisation "STEMRA". 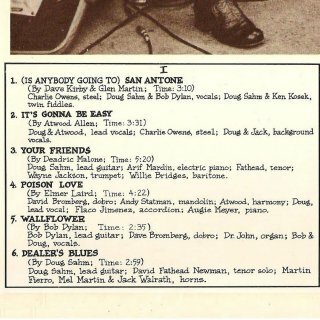 Thanks to Manfred Endtner for information and scans of this album signed by organist Augie Meyers. 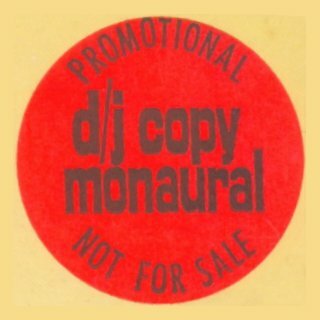 This album was released in France with the usual front but with a different catalogue number (not listed on the front). 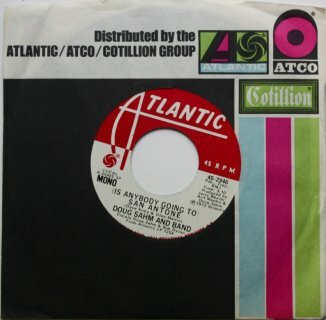 It was made and distributed by Filipacchi Music and the sleeve was printed in France by Graphicolor. 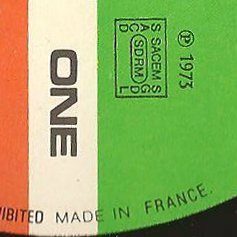 The record labels have the usual green/white/orange Atlantic design with "MADE IN FRANCE" and the French "SACEM" logo. 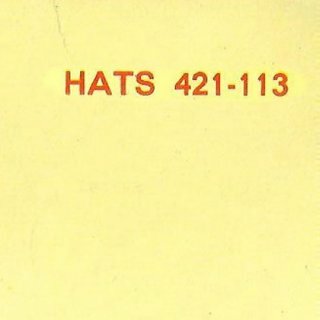 Hispavox/Atlantic HATS 421-113 (Spain) - front scan by Manuel García Jara The rare Spanish release of this album was made, printed and distributed by Hispavox for Atlantic Records. 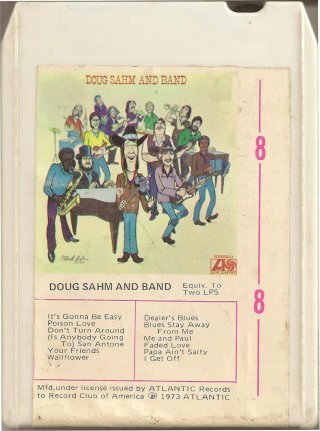 It has a fully laminated sleeve. 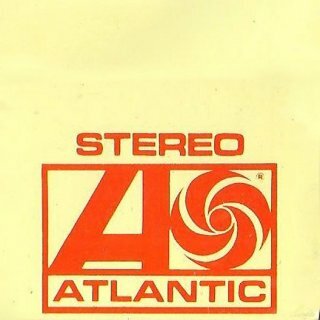 The front has an exclusive catalogue number ("HATS" = Hispavox Atlantic Stereo) at top right and the Atlantic logo at bottom right. 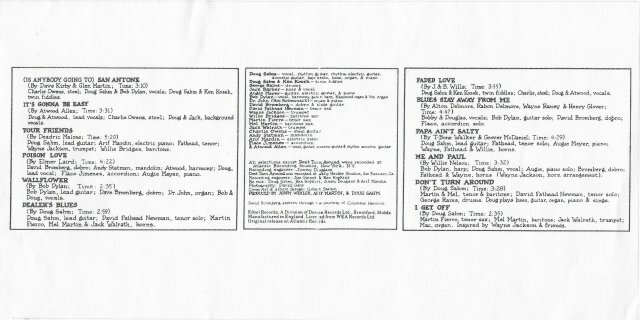 The rear has the tracklist and musician credits in Spanish. 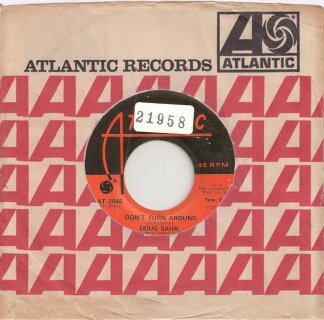 The Spanish record labels have a different design: at this time all worldwide Atlantic Records releases had green-white-orange labels with the Atlantic logo at the top as for the French release above; these Spanish labels are orange-white-pink with the Atlantic logo in the white centre panel. 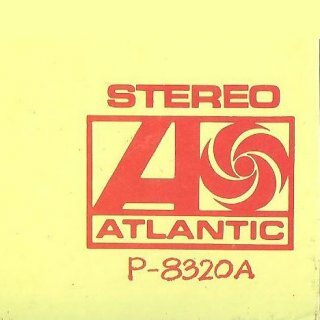 Atlantic P-8320A (Japan) - front with obi, scan by Manuel García Jara The rare Japanese release of this album was manufactured and distributed in Japan by Warner Pioneer on behalf of Atlantic Records. 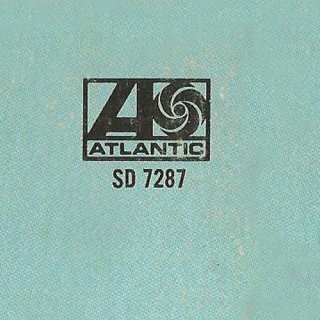 The front sleeve has the Atlantic logo and the Japanese catalogue number. 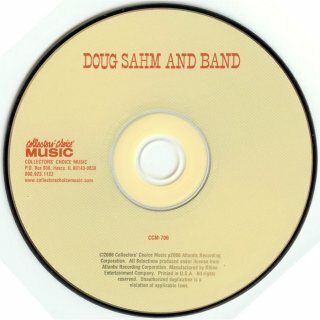 The album has a white and red obi with a price of ¥2000, also printed on the rear sleeve. 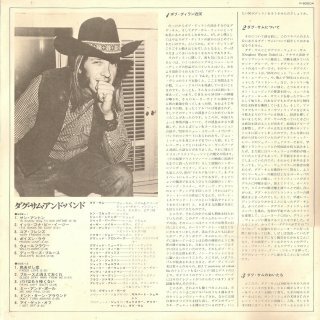 It includes a four-page Japanese/English insert. 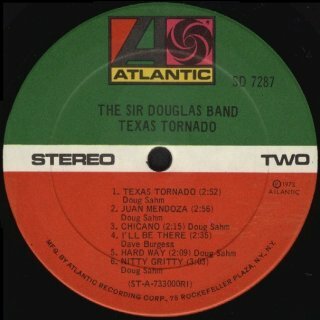 The record has the usual green/white/orange Atlantic labels with song titles in English. 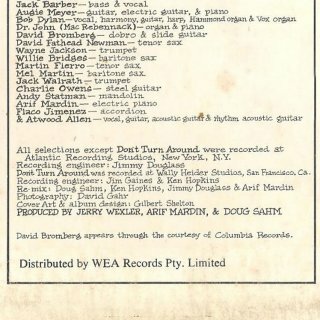 Atlantic SD 7254 (Australia) - front scan by Manuel García Jara This album was made and distributed in Australia by WEA Records Pty. 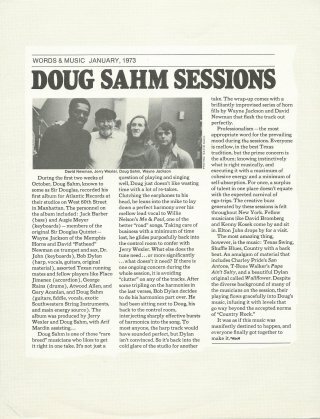 Limited. 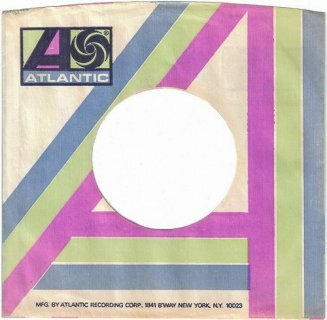 It has the same front sleeve with the Atlantic logo and catalogue number as the US release. 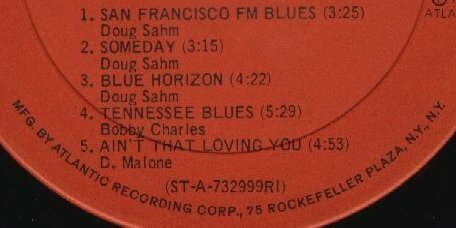 The composer credits are missing from the tracklist on the rear sleeve. 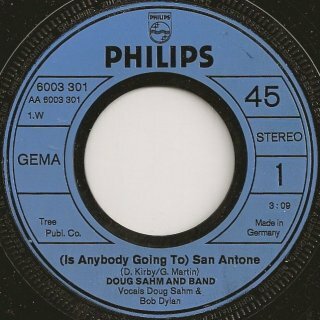 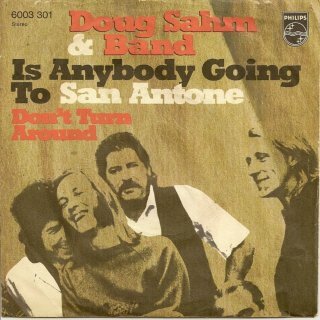 The correct title of track 1, Side 1, is "(Is Anybody Going To) San Antone", but on the UK Atlantic release the song title has no brackets and on this Australian release it is incorrectly shown as "(Is Anybody) Going To San Antone" on the Side 1 label, even though it is correct on the rear sleeve. 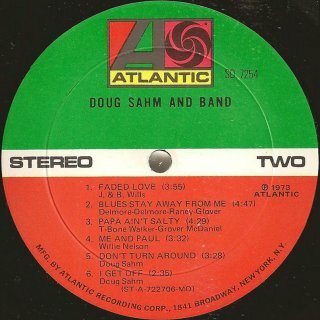 Atlantic SD 7254 (New Zealand) - front scan by Stuart Moore The New Zealand 1973 LP was made in New Zealand by His Master's Voice (N.Z.) 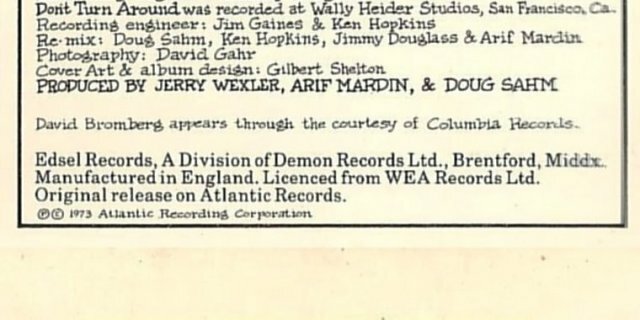 Ltd. (a branch of EMI) for Atlantic. 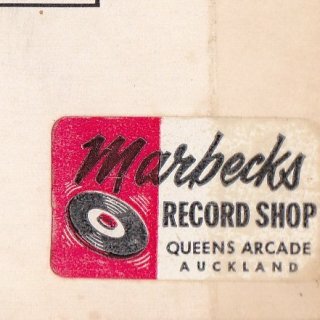 On the sleeve the manufacturer is EMI (New Zealand) Limited. 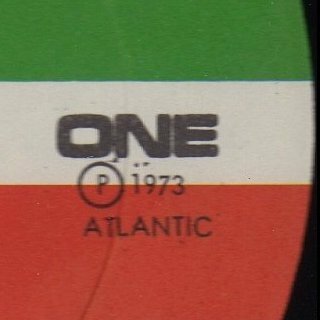 The record has the usual green/white/orange Atlantic labels. 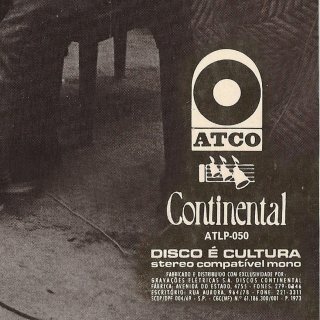 Atco ATLP 050 (Brazil) - front scan by Manuel García Jara This is the rare Brazilian release of this album. 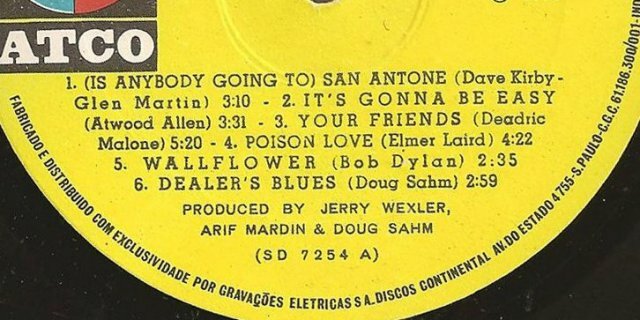 Like all records from the WEA group in Brazil, it was made by Discos Continental/Gravaçôes Electricas (the same manufacturer and distributor of Planet Waves and Before The Flood for Asylum Records, and of the second editions of Desire and Bob Dylan's Greatest Hits for CBS). 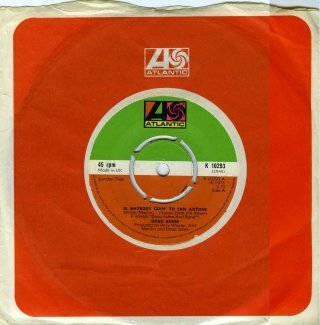 This Brazilian album was released by Atco, a subsidiary of Atlantic Records, but not by Atlantic itself. 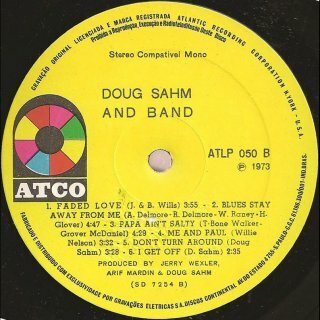 The sleeve was printed in Brazil by Miruna Litografia Ltda. 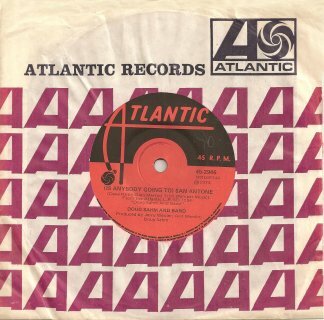 The album has the usual front sleeve but without the Atlantic logo at bottom right; the rear sleeve has Atco and Discos Continental logos. 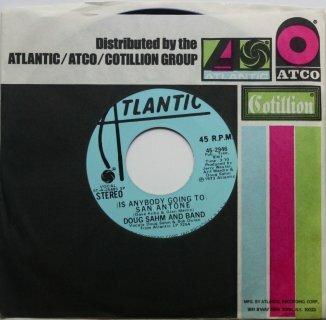 The record has unique yellow Atco labels. 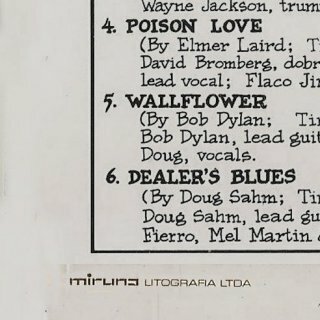 The record labels of the copy owned by Izidio Filho have slightly different placement of the variable information (album title, catalogue number, song titles) from those of Manuel García Jara's copy. 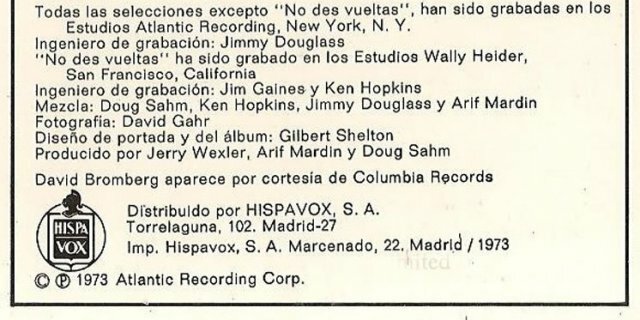 Thanks to Manuel García Jara and Izidio Filho for information and scans. 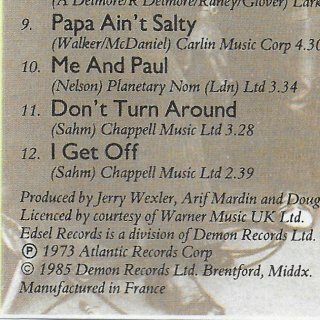 Edsel/Demon ED CD 154 (UK, 1985) - front scan by Peter Gilmer This album was re-released on both vinyl and CD by Edsel/Demon in the UK in 1985 - information from Peter Gilmer. 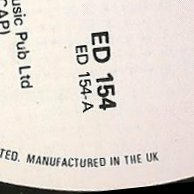 Although intended for the UK market, this 1985 release was actually made in France. 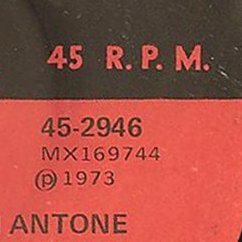 Ronald Born has a 1990s copy which was also made in France and has the same front and rear as shown. 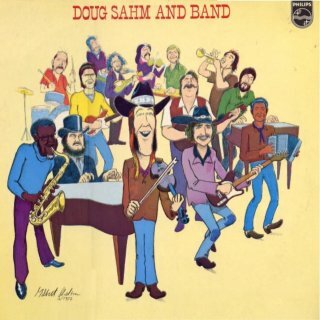 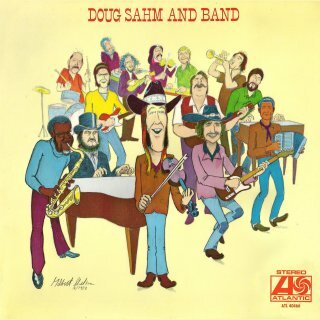 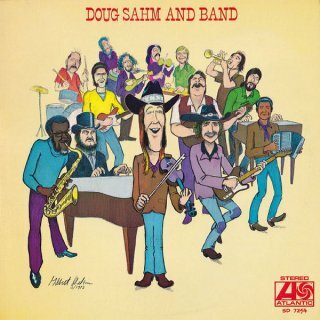 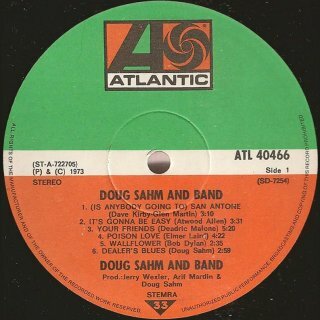 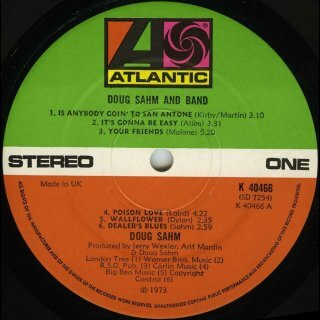 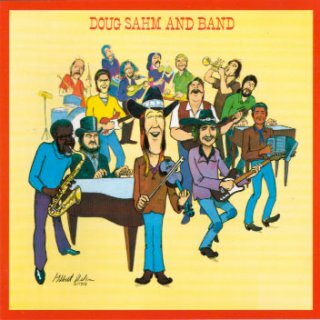 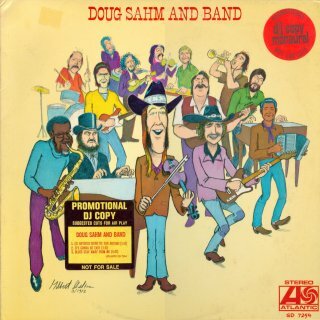 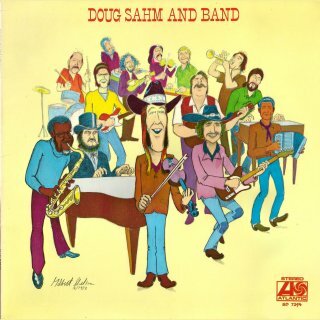 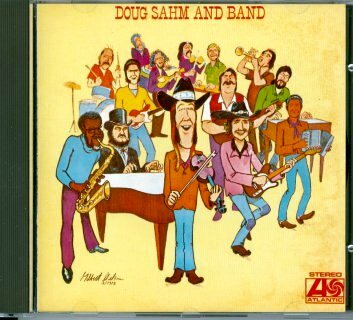 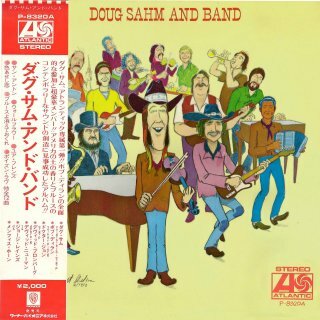 Doug Sahm And Band was released on CD in Japan as Atlantic AMCY-46 around 1990, and this CD not only retains the original album art but is reportedly an excellent remastering - information from Rob van Estrik. 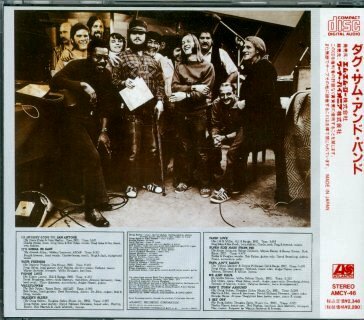 The Japanese release has a white obi with red text and price ¥2,348 (¥2,280 excluding tax). 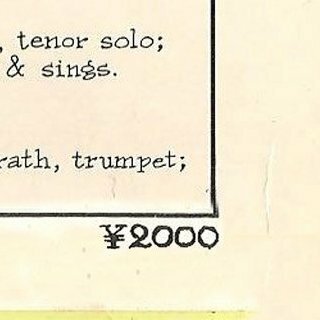 There are no dates on the obi, but the date of 1990 from an Internet source is consistent with Dylan Japanese CD releases with the same price of ¥2,348. 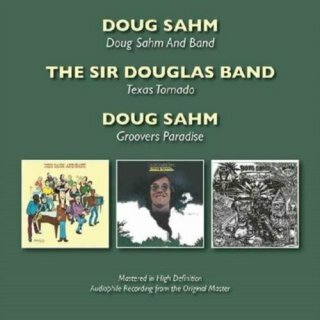 This album was released on CD in the USA with ten unreleased tracks as CD1 of the Rhino Handmade 2CD set The Genuine Texas Groover in 2003. 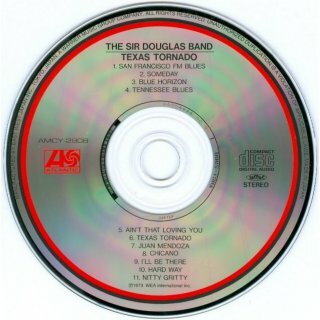 The single album was released on CD in the USA by Collector's Choice Music in 2006 and was re-released on 31 Oct 2008. Doug Sahm And Band was re-released in the UK by reissue label BGO (Beat Goes On) Records in 2016 as part of a three album set with Texas Tornado (see below) and the 1974 Warner Bros album Groover's Paradise with no Dylan content. 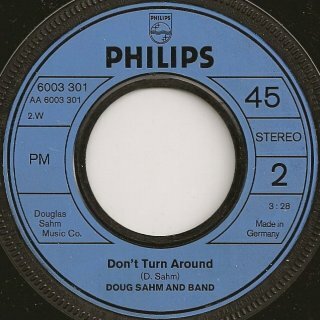 Thanks to Peter Gilmer, Arie de Reus, Jack Guerreiro and Paul Shenton for information and pictures. 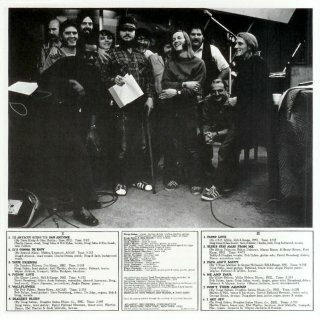 The B-side of the commercial singles, Don't Turn Around, does not include Bob. 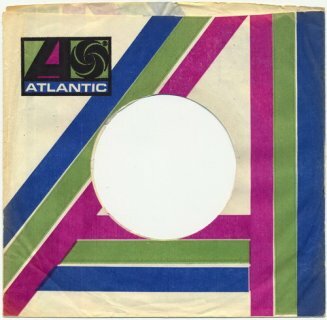 The 1973 US and UK promo and commercial singles came in generic Atlantic sleeves. 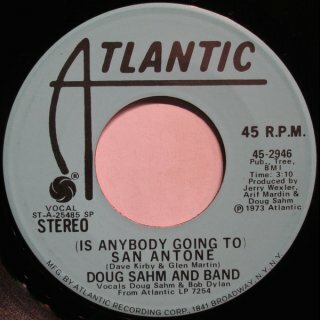 The US promo single has (Is Anybody Going To) San Antone on both sides in mono and stereo and comes in two variants. 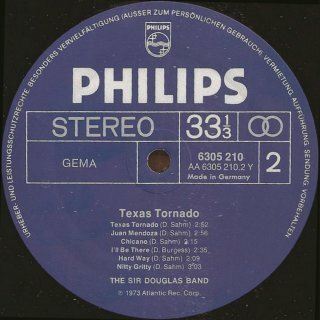 The mono side (R-0090M) of the first variant is pictured in the booklet with the 2003 Rhino Handmade 2CD compilation The Genuine Texas Groover, see 2003. 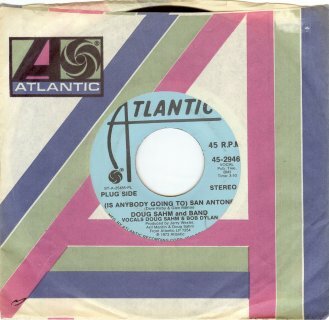 This variant of the single has the song title on one line, "PLUG SIDE" on the left on both sides with "MONO" or "STEREO" on the right. 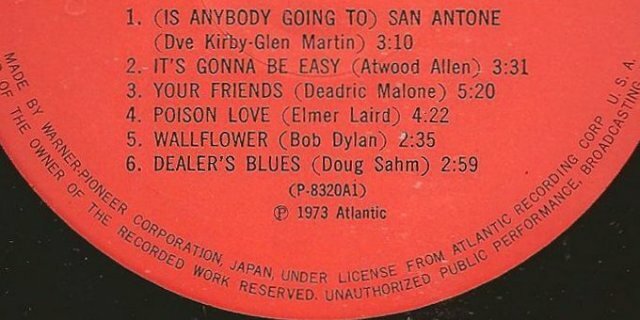 Hans Seegers' US promo copy is from a different Atlantic pressing plant with a variant label design - changes include the title on two lines, "MONO"/"STEREO" on the left instead of the right, and the text "PLUG SIDE" is missing. 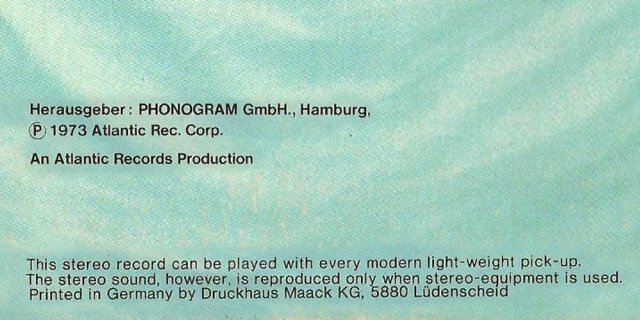 The stereo sides (R-0090, as on the albums) have the same label designs but are in plain blue instead of red/white. 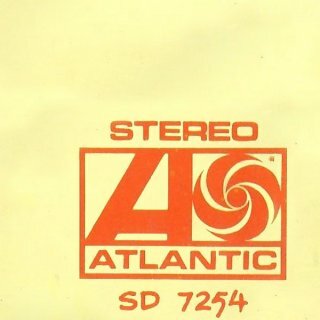 The US commercial single has grey Atlantic labels with the same design as the second promo variant. 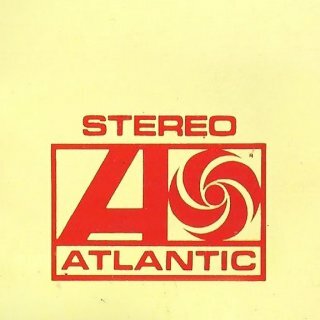 The Canadian commercial single, presumably stereo, comes in a generic Atlantic Canada sleeve and has black/red Atlantic labels. 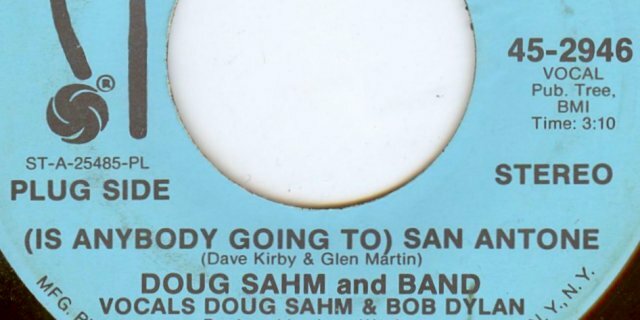 There is a sticker with "21958" on both labels of this copy, probably from a radio station. 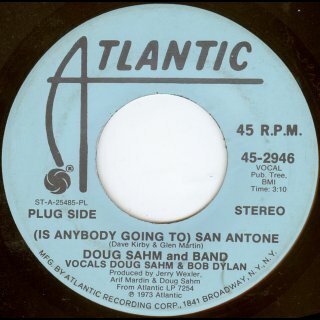 Bob’s involvement is made very prominent on the US and Canadian singles with text “Vocals Doug Sahm & Bob Dylan” (in upper case on the first US promo variant). 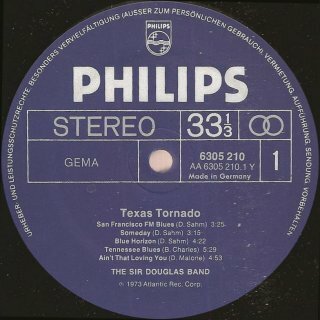 The UK promo and commercial singles did not have picture sleeves. 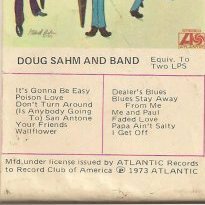 The picture of the rear sleeve of the West German Philips single is also behind the CD tray in the digipak of the CD version of Doug Sahm & Band from 2003's The Genuine Texas Groover (see 2003)! Both the Dutch and West German singles have "Vocals Doug Sahm & Bob Dylan" on the A-side, although the UK singles do not. 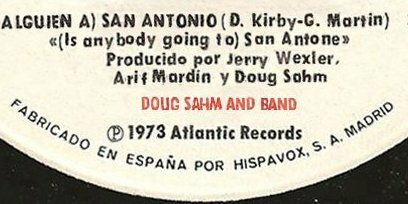 Thanks to Hans Seegers, Ole Lien, Sam C. Visser, Kenneth Robson, Manuel García Jara and Dag Braathen for information and scans. Atlantic/Hispavox 45-2946 (Spain) - front scan by Manuel García Jara In the period 1970-74 Hispavox released some very rare singles to promote albums of the companies distributed by them in Spain (Warner, Elektra, Atlantic, etc.). All of them are promotional singles with white labels and a monochrome sleeve made of fragile paper (commercial singles made by Hispavox always had excellent quality sleeves). 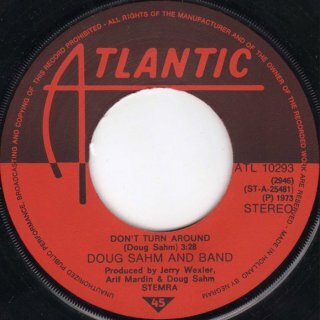 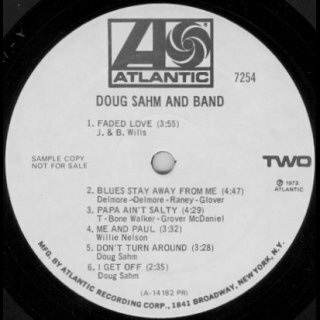 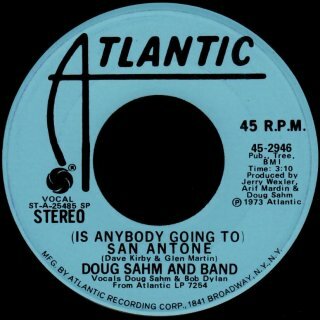 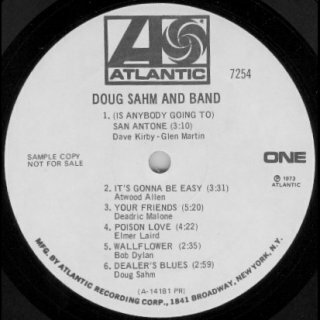 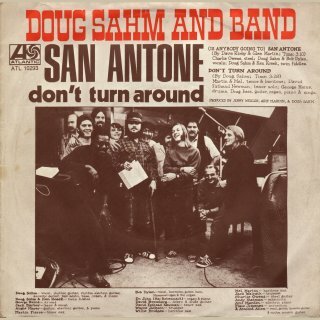 These promo singles were pressed exclusively for radio stations and they often have different B-sides from the commercial singles and some of them, like this Doug Sahm single, were never released as commercial records. 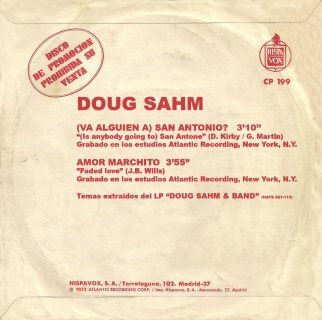 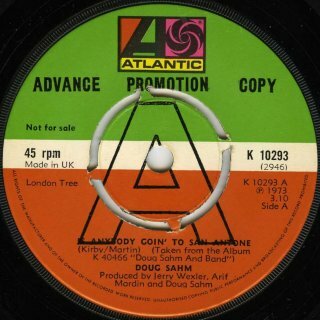 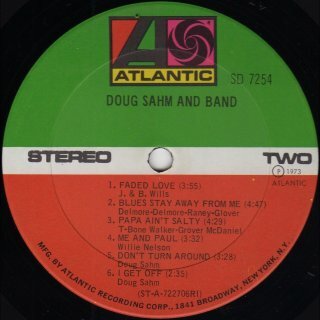 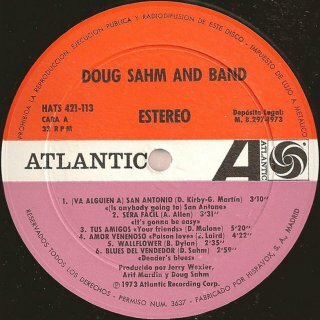 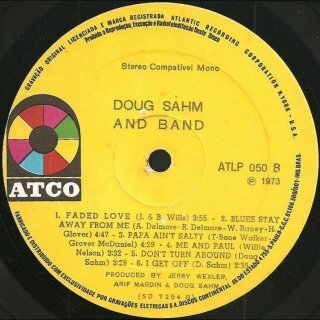 This single, with an unique worldwide B-side (Amor Marchito [Faded Love]), was made to promote the Atlantic/Hispavox album Doug Sahm and Band, which was released in Spain in limited quantities only. 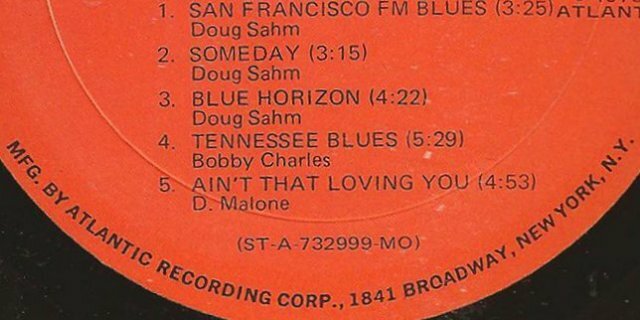 This means that, unlike the singles above, Bob plays on both sides. 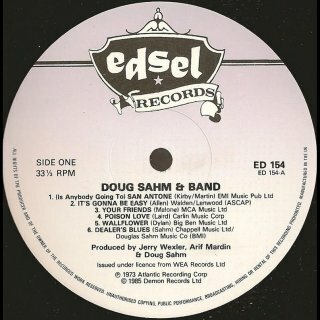 The fragile sleeve is not in perfect condition. 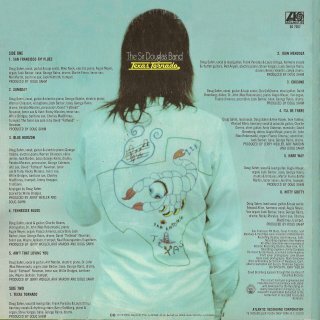 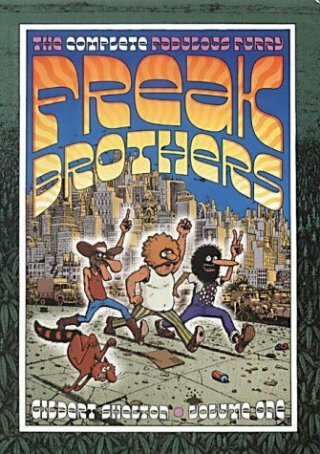 The front has the Gilbert Shelton illustration with the usual Spanish promo text printed, not a sticker, and song titles in Spanish. 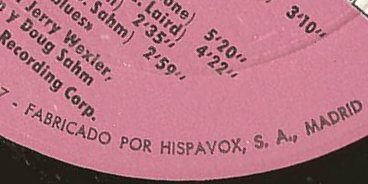 The rear has the Hispavox logo and address. 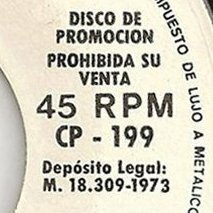 The record labels are white with titles in Spanish and in English. 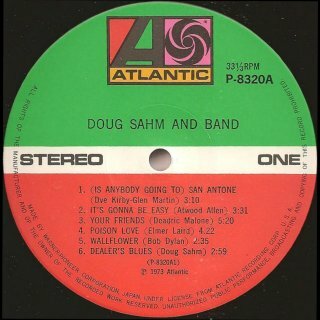 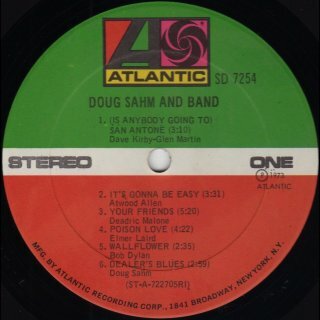 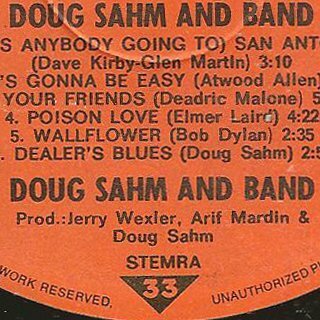 The A-side has a sticker of a radio station and "DOUG SAHM AND BAND" printed in red, not present on the B-side. 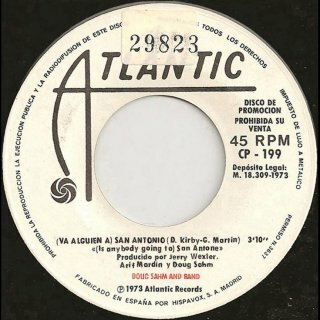 Atlantic 45-2946 (Australia) - A-side scan by Manuel García Jara (R-0090 or R-0090M) This Australian 7" single has the same catalogue number as the US single but was released with an exclusive different B-side. 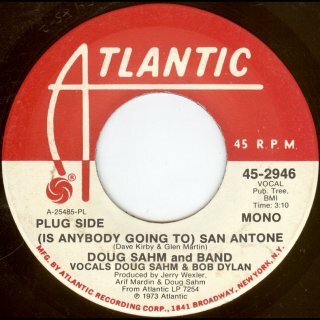 This again means that, unlike the singles released in the USA, the UK and elsewhere, Bob plays on both sides. 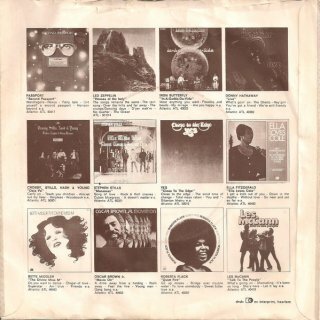 It came in a generic Atlantic sleeve as shown. 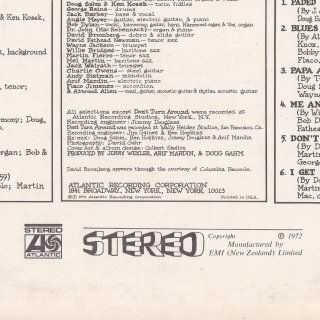 However, is it mono or stereo? 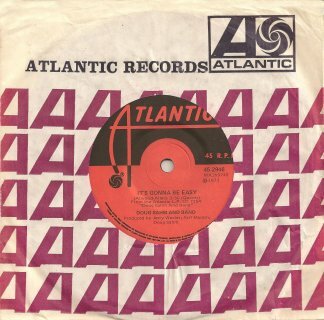 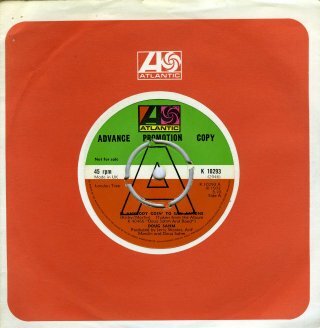 The record labels do not have "Stereo" to the right of the centre hole unlike the earlier 1973 Atlantic Australia 7" single example from Led Zeppelin shown. 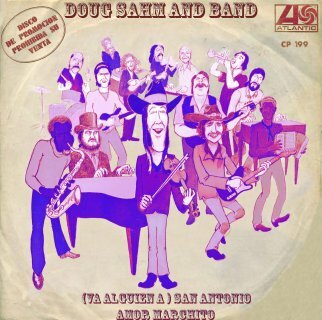 This album consists of four new tracks including the title track recorded at Wally Heider Recording Studios, San Francisco, CA, and seven tracks recorded at the Doug Sahm & Band sessions, Atlantic Recording Studios, New York, 9-12 Oct 1972. 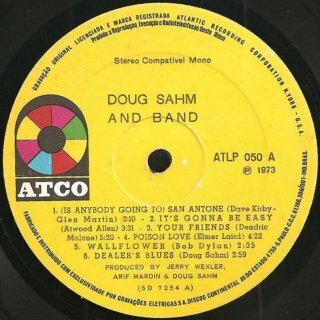 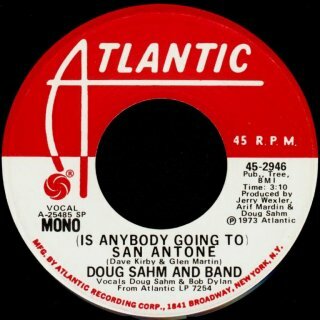 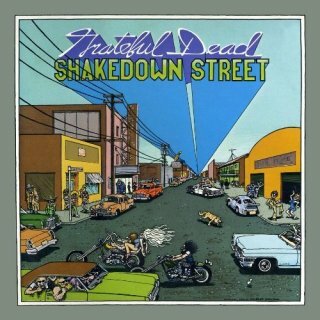 For the original Doug Sahm & Band album, see above. 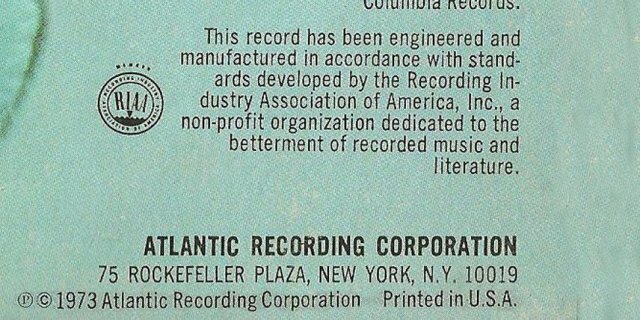 During 1973 Atlantic Records moved to 75 Rockefeller Plaza, New York, NY 10019, and this new address is on the rear of the sleeve. 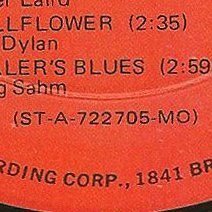 This is also the address on the record labels of Hans Seeger's copy, but Manuel García Jara has a copy of the very earliest release of the album, where the record labels still have the previous address of 1841 Broadway, New York, NY 10023, as on the sleeve and record labels of Doug Sahm & Band above. 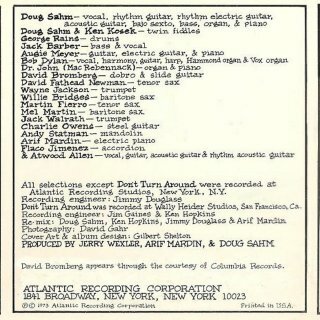 The rear sleeve of this earliest release still has the Rockefeller Plaza address! 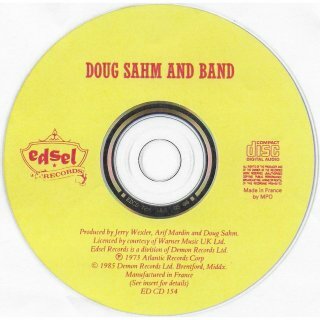 Recorded at Doug Sahm & Band sessions, Atlantic Recording Studios, New York, 11 Oct 1972, re-released on CD in 1992 on Doug Sahm & Friends: The Best Of Doug Sahm (Atlantic Sessions) - see 1992. Recorded at Doug Sahm & Band sessions, Atlantic Recording Studios, New York, 12 Oct 1972, re-released on CD in 1992 on Doug Sahm & Friends: The Best Of Doug Sahm (Atlantic Sessions) - see 1992. 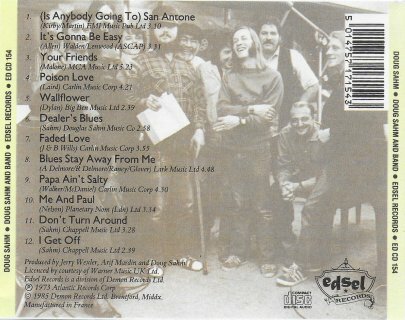 All these tracks also appear on the 2003 Rhino Handmade 2CD compilation The Genuine Texas Groover, see 2003. 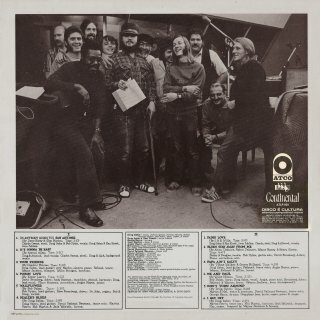 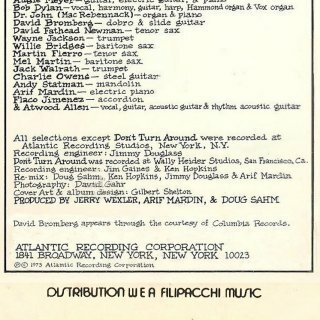 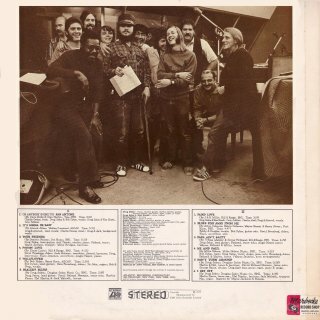 That album credits Bob on Tennessee Blues and I'll Be There, although he's not mentioned at all in the credits on the 1973 rear sleeve even though David Bromberg is listed as appearing through the courtesy of Columbia Records. 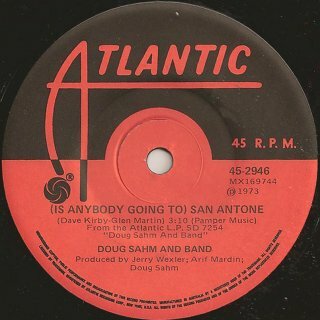 Thanks to Glen Dundas for the initial information and to Hans Seegers and Manuel García Jara for scans. 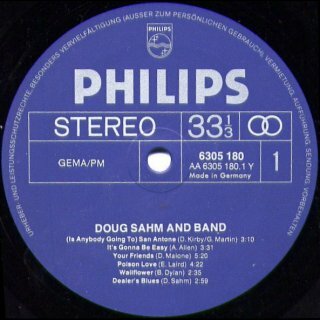 Philips 6305 210 (West Germany) - LP front scan by Manuel García Jara Like the album Doug Sahm And Band above, this album was released in West Germany on the Philips label, and made and distributed by Phonogram GmbH for Atlantic Records. 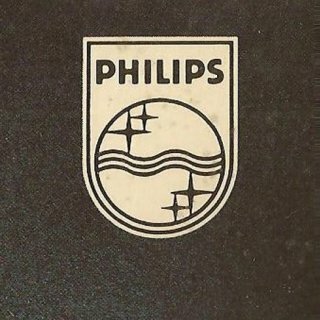 The sleeve is fully laminated with Philips logos on front and rear. 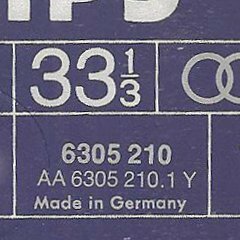 It was printed in Germany by Druckhaus Maack KG. 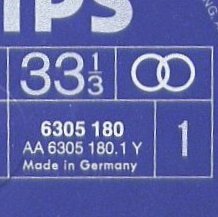 The record has Philips Germany dark blue labels. 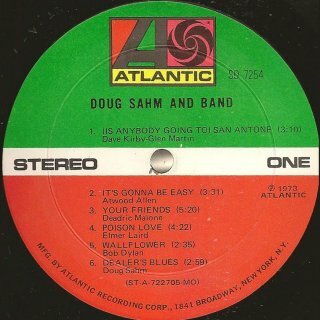 Atlantic SD 7287 (Australia) - LP front scan by Manuel García Jara Like the album Doug Sahm And Band above, this album was manufactured and distributed in Australia by WEA Records, Pty. 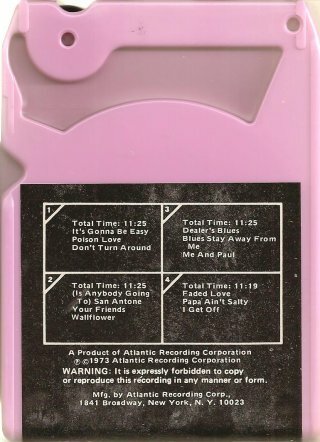 Limited. 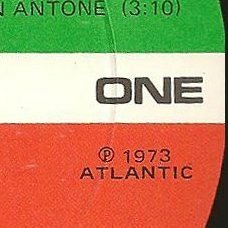 The record has the usual green/white/orange Atlantic labels. 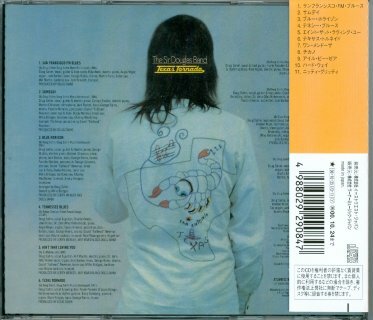 The 1998 Japanese CD release has a buff obi with black text and price ¥2,100 (¥2,000 excluding tax). 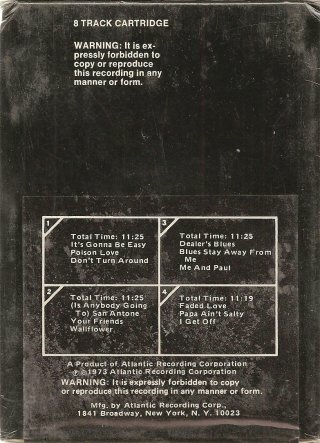 The release date is "98-10-25" (25 Oct 1998) and the withdrawal date is "00-10-24" (24 Oct 2000). 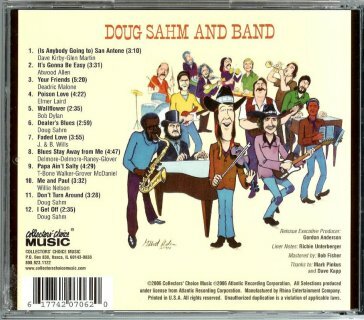 This album was released on CD in the USA with nine unreleased tracks as CD2 of the Rhino Handmade 2CD set The Genuine Texas Groover in 2003. 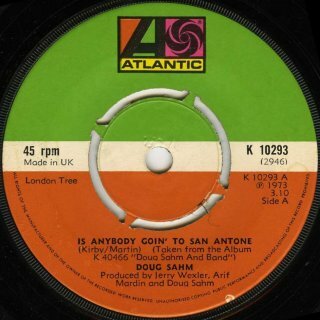 Thanks to Arie de Reus for information and scans and to Jean-Pol Hiernaux for information about the 2006 Collector's Choice Music US release (CCM 707 - Doug Sahm And Band above was CCM 706). 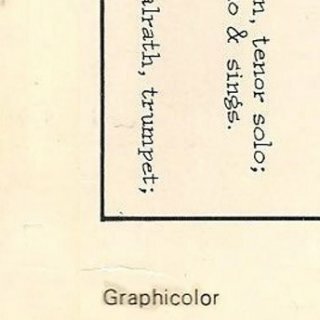 More scans required! 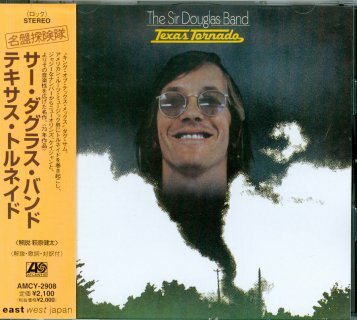 Texas Tornado was re-released in the UK by reissue label BGO (Beat Goes On) Records in 2016 as part of a three album set with Doug Sahm And Band (see above) and the 1974 Warner Bros album Groover's Paradise with no Dylan content. 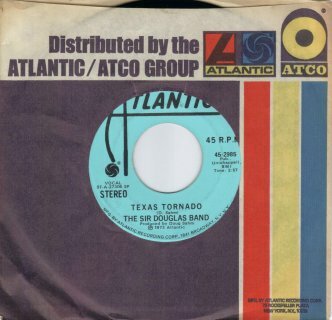 Atlantic 45-2985 (USA) - promo 7" single A-side scan by Manuel García Jara (no Dylan) This stereo/mono 7" promo single in a generic Atlantic/Atco sleeve has the title track from the Texas Tornado album on both sides in stereo and mono versions. 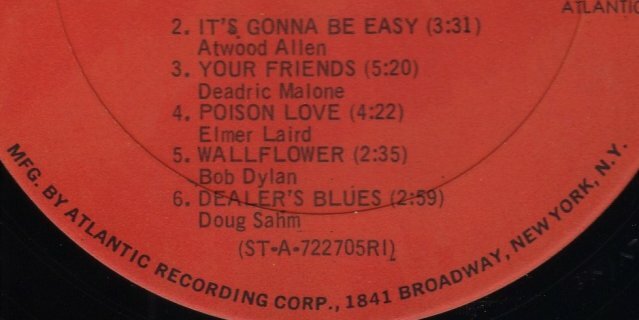 There is no Dylan involvement on this track. 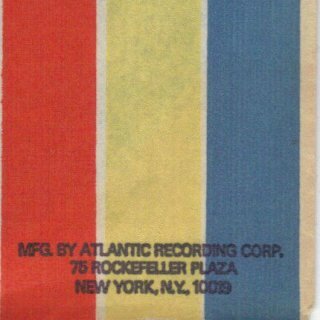 This is a third Atlantic generic sleeve for 1973 and it now has the Rockefeller Plaza address (see above).